Accessories I need to open my garage door with my smartphone? You may also use your tablet for opening and closing your garage door. For assistance in making the right choice when time comes to choose the type of windows for your garage door, contact us. If you wish, we can supply you with a free, written quotation. First, you need to know that not every brand of garage door opener has this option. We’ll start by examining the most popular ones, LiftMaster, Chamberlain and Craftsman openers. Keep one year in mind – 1998. Why? That was the year the Chamberlain company and its trademarked LiftMaster and Craftsman brands, started offering its Security+ system. How do know when a garage door opener was made? That’s easy to solve. Look on the metal housing of the motor and you should see written Security+, Security+ 2.0 and if it was manufactured after 2012, the MyQ logo. Alternatively, you can make sure by looking for the “Learn” button. It should be a yellow square, a purple square or a yellow circle. There should also be a sticker on the motor that will give you the opener model number and its date of manufacture. If your opener isn’t one of the three brands mentioned previously, happily the MyQ application is designed to be compatible with several brands of garage door openers that use rolling code technology. Even so, MyQ technology doesn’t work with garage door openers whose remotes use DIP switches (in +, 0 and – positions). And since August 2017, Wi-Fi (the logo is seen on the motor chassis) has been integrated into door openers in addition to having the Security+ 2.0 system. This button is also Yellow. Next, what else do I need? You will need two accessories to be able to link your door opener to the MyQ app. One 888LM wall control panel. Be aware that this comes standard with the 8500C model, and one Internet Gateway (828LM). You will only need the Internet Gateway (828LM). So, no more wondering, and now with MyQ technology, you will know if your garage door is open or not. 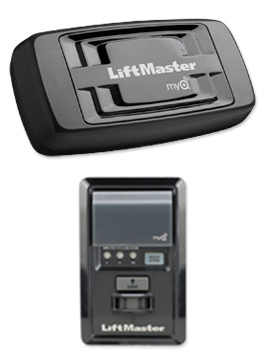 For your information, be aware that since August 2017, Chamberlain and LiftMaster door opener come equipped with MyQ technology and integrated Wi-Fi. With the Wi-Fi system, you can add peripheral devices like home lighting and also interact with the biggest name in integrated home technologies like Apple HomeKit and Google Home.